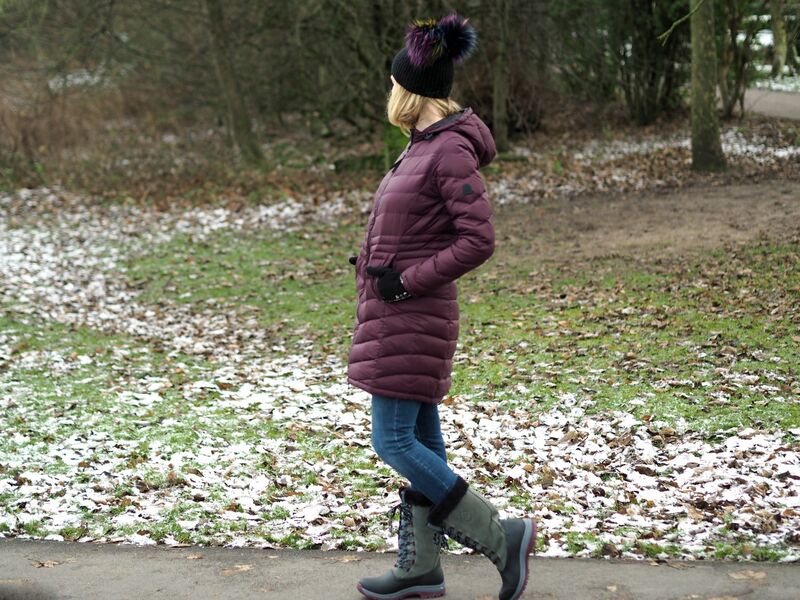 How To Keep Warm And Look Stylish (In The Snow). As you know, I spend most Saturday and Sunday mornings watching my son play football. It’s cold enough at the best of times here in North Yorkshire, and it’s been below freezing for about five days now, but standing still for several hours in the depths of winter on an exposed pitch can be absolutely bitter. I’ve been looking at how to keep warm and stay stylish for a while now. It’s imperative that this type of clothing is functional, first and foremost. It MUST serve the purpose and do its job properly. With that being said though, I still want to look my best. It takes up too much of my weekend for me not to look and feel my best and most comfortable. I want to keep warm AND look stylish. The general consensus is that a down, (or puffer), coat is the best option. I wanted one with a longer length and a neat, flattering fit. Many are black or navy; I prefer something a little brighter but in a colour that won’t date. After looking at a lot, I decided upon burgundy. This is the Bramley by Tog 24 and I bought it from House of Fraser. It’s currently reduced from £160 to £112 and is available in black and in grey too. It’s very lightweight, so much so that I didn’t quite trust it would keep me warm enouugh. I need not have worried. The diagonal baffles, (I didn’t know they were called baffles until I begun researching down coats), make it more flattering than horizontal ones. It goes without saying that football pitches in winter are muddy. In fact football pitches can be muddy all year round, so I almost always wear wellies. The thing is though, even those lined with neoprene don’t provide much in the way of heat insulation. Standing still for around two hours leads to feet so numb that sometimes, I can barely drive home. When I was at River Cottage in September, (a press trip organised by Muck Boots), I asked their advice and they recommended their Arctic range. 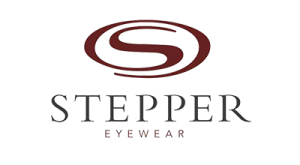 They subsequently invited me to choose a pair which they very kindly gifted to me. Every style in this range has a fleece lining and a rugged sole. 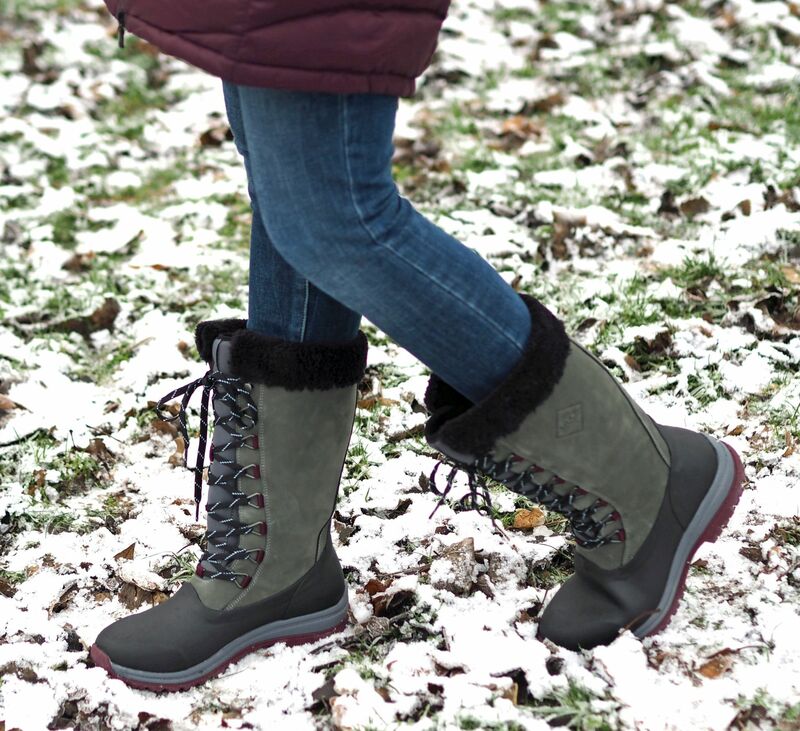 I chose the Artic Apres lace-up tall boots because they make a change from my wellies and this colourway because the wine coloured trim matches my coat. Why not? 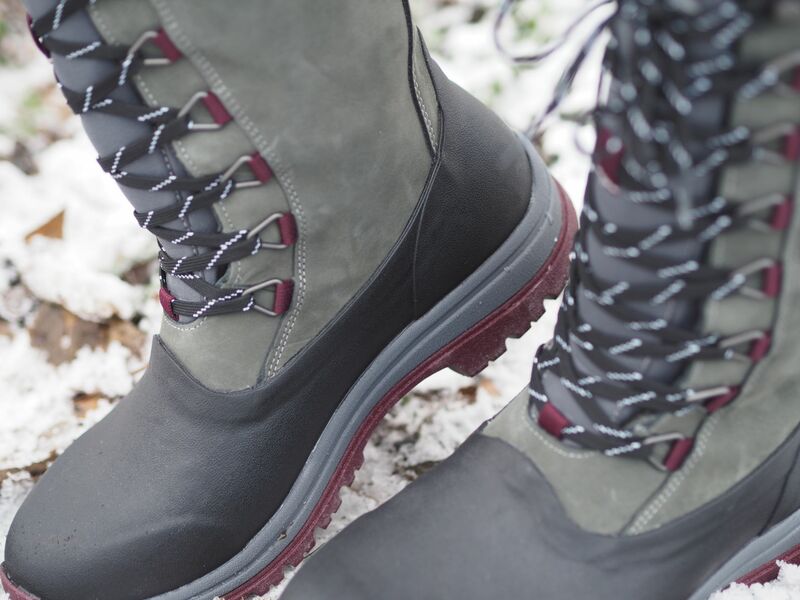 I can’t tell you how warm they are and they’re brilliant in snow and ice because of the grippy sole. I’m delighted with them. My relationship with hats is ambiguous. I like how they look and the warmth they impart, but, it’s tricky with a fringe. I either keep my fringe where it is and have it pushed into my eyes by said hat, or, sweep it up and put of the way which means I look like Cameran Diaz in “There’s Something About Mary!” when I remove it. Neither is a particularly good look. However, I’m not so vain that I’d suffer the cold; I have an array of beanies and bobble hats. 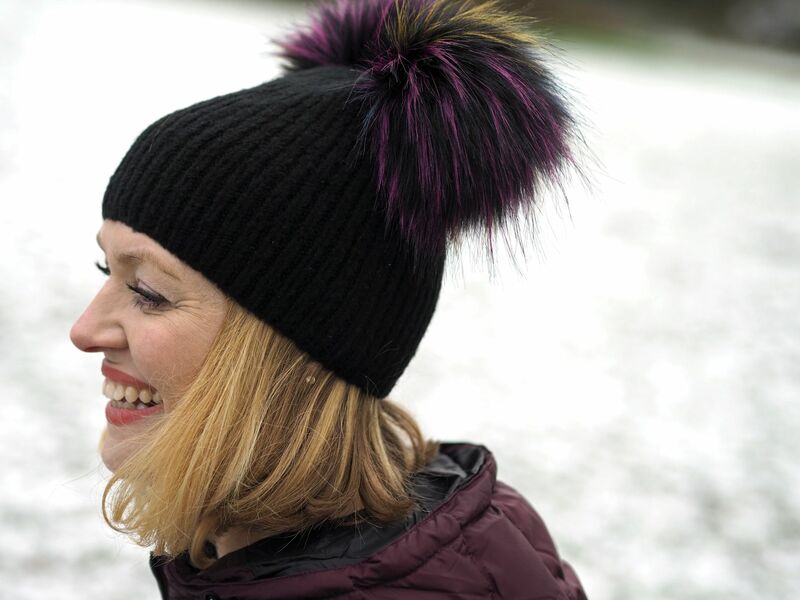 This double multi-coloured pom pom hat was an inpulse buy from Topshop and I love it! The poms poms have the same shade of burgundy in them as my coat and wellies. 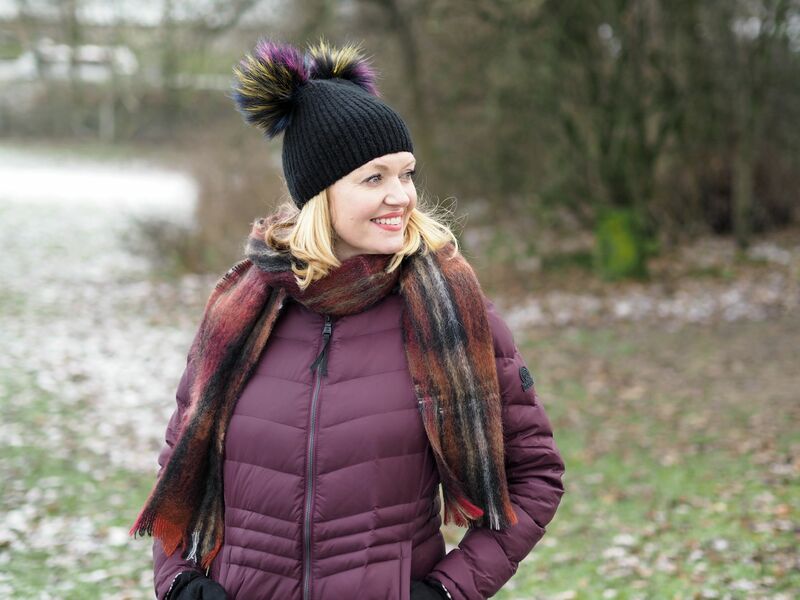 It injects a bit of fun and personality into a sensible outfit and it’s available in different colourways including a gorgeous blush and a fabulous red. And finally, my scarf. You might recall that I’ve been working woth Yorkshire-based brand Samuel Tweed? I have written about their mohair serapes on a few occasions. Well this plaid mohair scarf is from there too and was gifted to me as part of the collaboration. Again, I chose it for both its benefits, (super soft and super warm), and its aesthetics; it matches the rest of my outfit. Because I’ve been working with Samuel Tweed, I’m able to offer an exclusive discount of 15% on all accessories, (including serapes), with the code LIZZY15. The scarves retail at £29, so the discount takes the price to £24.65, an excellent price for such a beautiful scarf. So, this is probably the most practical outfit I’ll ever wear! 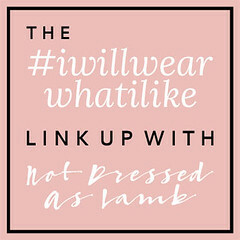 I hope you agree that a few carefully chosen accessories in toning or matching colours can pull an outift together and make even the most sensible of outfits that little bit more stylish. Great outfit and love the colours. I have spent at least 10 years freezing whilst watching football, rugby, hockey and at times in the UK summer cricket and struggled to find things that are stylish and practical. Sadly my son in now driving and no longer needs lifts and will be off to Uni next year so my need isn’t the same. Great to see that you can get something stylish now though, even if too late for me. I must admit hockey is better than rugby and football as there is no mud involved with today’s astro pitches. Off to look at Muck Boots now though, yours look fab. Stay warm. Oh god, I remember standing watching the boys play football in the winter – awful! Love the coat it looks super warm, and a great length to cover your behind. 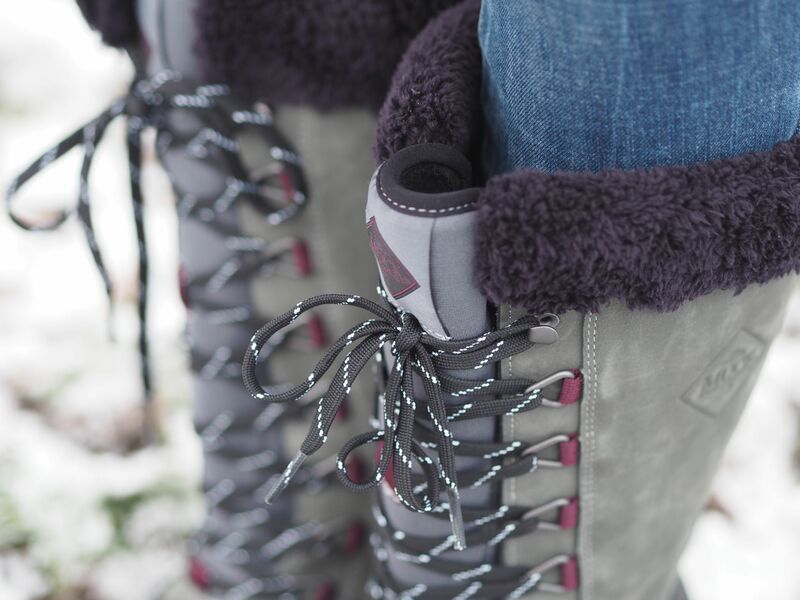 Super cute boots too, they’d be perfect on the slopes. Puffer jackets are my favourite. This one is such a lovey colour and I love the accessories.